On a recent holiday we went for a walk in the woods, Linda and I, up the Little Mount Si trail. It’s not an exceptionally rigorous trail. It peaks at 1576 feet but most of that elevation is gained in the last half mile on a staircase made of gnarled root and worn stone. Nor is it especially remote, only a half hour drive from our home in Pleasant Valley, through Fall City and Snoqualmie to North Bend, and less than a hour from the streets of Seattle along Interstate 90. 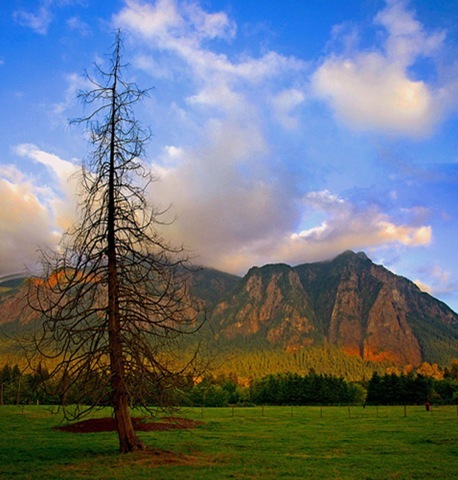 An amazing photo of Mount Si from the Snoqualmie Valley. One (or the other) of the most climbed mountains in the US. We walked loaded down with 20 pound day packs—a gallon of water, maps, compass, handheld GPS, spare socks, jacket, hat, first aid kit, poncho, emergency survival suit, binoculars, a Brunton barometer, my old Gerber sheath knife. Few people on the trail carried even a coat. One woman carried a Pomeranian. I felt substantially overdressed. We often walk in the Cascade wilderness where inattention, bad luck, or misjudgment can be disastrous. I once heard that the third in a sequence of mistakes is the one likely to kill you. The first or the second may not be harmless but the third can be be fatal. Like three on a match. My guess is that by the third mistake death has time enough to accurately gauge your range. The first mistake is underestimating your environment. The second is overestimating your resources. We carried our packs past the sheer cliff face where the technical climbers practice their skill, past the bench dedicated to a climber who never returned from the summit of Mount Everest. You can see the various pitches by the tracing of pitons and carabineers left in the rock. I wondered if climbers trusted themselves to pitons driven by a stranger. I doubt I would. I learned to practice distrust as a sailor on a coast that invites shipwreck. It was my job to cultivate negativity, to imagine the disastrous, to embrace the darkness and never be surprised. It is a skill fallen upon hard times lately, disreputed by a generation raised on positive thoughts and benign expectations. But even with practice I’m still surprised, as surprised as the day David Koch went missing. I met him Tuesday afternoon. He was making a promotional tour for his magazine, DM Review. I was the marketing manager of a small software company that bought his advertising space. He had a boyish face and thinning hair. His smile seemed expectant, as if someone were about to deliver a punch line. His conversation was softly spoken and hesitant or perhaps merely polite, paced to encourage interruption. He was, after all, from Wisconsin where time flows like glacial ice. The rock face on Little Mount Si. Photo attribution: tarnalberry. The Vancouver Sun reported the contents of his rental car left at the base of Grouse Mountain. There was the stuff typical of a business trip—dress shoes, white shirt, black suit, laptop, Blackberry—and the embarrassingly human details—a receipt for a Butterfingers and a nail file. It’s rather startling, like peering from the window of an elevated train into someone’s apartment and witnessing an unguarded moment, a candid gesture or expression that is utterly unimportant and completely human. He liked Butterfingers. It’s simply not something you expect to know about a dead man you met only once. I was likely one of the last people to see David alive and know him by name. He left my office in Pioneer Square and drove north to Vancouver, British Columbia. He crossed the Canadian border at 6:30 pm. Before checking into his hotel he stopped and bought a ticket for the tram to the top of Grouse Mountain. (The summer day’s are long in these latitudes, lasting until 10:00 pm, and Grouse Mountain is a place to hike convenient to Vancouver.) He didn’t return with the last tram of the day. He was never again seen alive. They found him eventually. A hiker followed the descending spiral of a bald eagle. The body had apparently been pinned underwater for some time. He had apparently fallen from the steep path above into a river in flood. I doubt that a day pack would have saved David but it might have made him walk more cautiously, weighted by the gravity of each step. And despite the extra work required to carry all that stuff, despite the complaining joints and stone-bruised heels, I think I’ll continue to carry my pack even on casual hikes, if only as a memento mori.